Join me this summer as I embark on a tour of museums around the world. 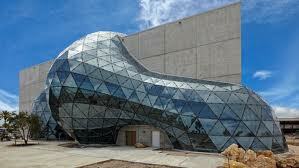 My first stop is the Dali Museum, located in St. Petersburg, Florida. The Dali Museum was formed by avid collectors A. Reynolds and Eleanor R. Morse. It houses more than two thousand works of art by Dali. Paintings from all periods of his career, as well as works on paper and objects, are included in the museum's permanent collection which spans more than four decades.